Title: 'Delineatio Omnium Orarum Totius Australis Partis Americae'. 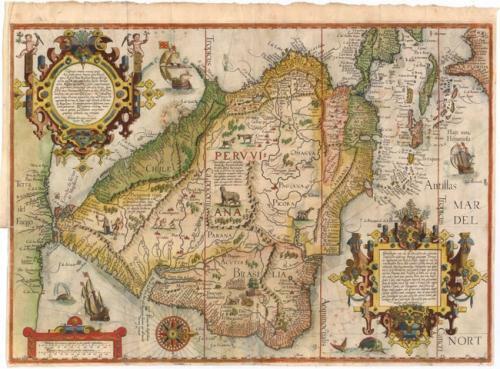 This is one of the most striking and decorative maps of South America and is an important early record of the continent. The map is oriented with north to the right and includes Florida and the West Indies. The Straits of Magellan are depicted with Terra del Fuego shown as a part of the great southern landmass. The coastlines are well defined and densely engraved with place names. The interior is filled with fictional mountains, rivers and vignettes of Patagonian giants, Brazilian cannibals and numerous strange animals, including a lion-like creature with a striped tail and human face. Other embellishments include large elaborate cartouches with descriptions of the region in both Latin and Dutch, sea monsters, galleons and a beautiful compass rose. Engraved by Arnold van Langeren from Portuguese and Spanish sources that Linschoten gathered while living for six years under the patronage of the Catholic archbishop in Goa. Issued folding on watermarked paper with lovely original color. There is some soiling, offsetting of color, and a small abrasion above distance scales. A 3" fold separation through Chili and a 1" fold separation through Cuba have been professionally reinforced on verso. There is a binding trim at left, and narrow bottom and right margins, as issued.